In Face Shift, identical algorithms control both sides of the face but one is slightly faster, over time creating visual patterns shifting from symmetry to asymmetry. Two DECtalk voice synthesis machines are deployed for each side of the face, calling out the identiﬁcation numbers of the activated muscles. Face Shift was originally presented as a live performance work. Videography by Ellen Zweig. 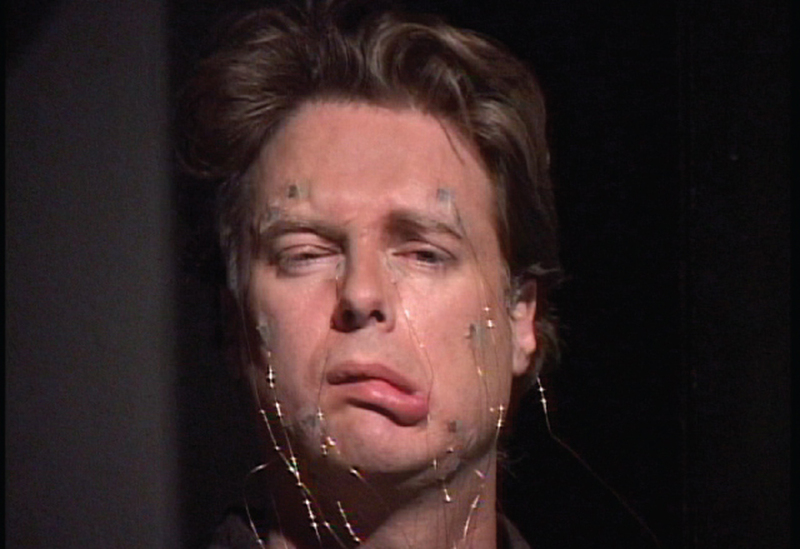 Electric Eigen-Portraits and Face Shift are two video works that both experiment with algorithmic facial choreography. These works turn a computer-controlled human face into a medium for kinetic art. Small, precisely controlled electrical impulses are employed to trigger the facial muscles of a live human being into rendering involuntary expressions. As the human face is controlled by a digital computer instead of a neural brain, it can be made to perform in ways that are often unusual and surprising. Face Shift from Arthur Elsenaar on Vimeo.